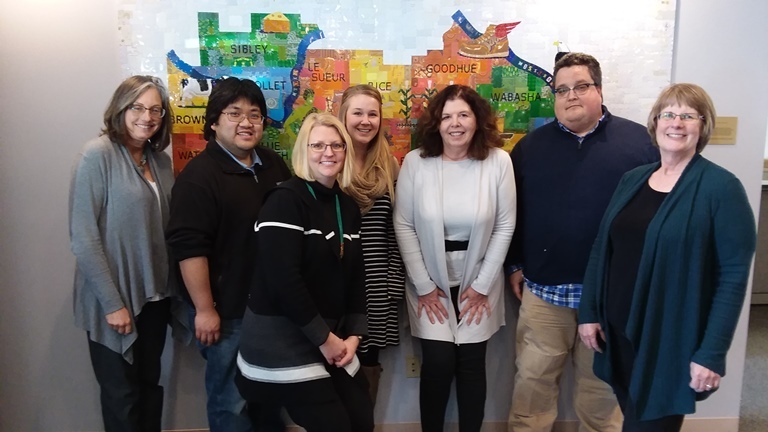 Owatonna, Minn., March 11, 2019 - Southern Minnesota Initiative Foundation (SMIF), in partnership with the Corporation for National and Community Service (CNCS), has awarded four sites to host full-time AmeriCorps VISTA members, a program that supports SMIF’s goal of creating economic vitality through entrepreneur development. VISTA Members are engaged with nonprofit organizations to build the capacity of programs and services targeted toward populations who are experiencing economic hardship. VISTAs serve in 501(c) nonprofit organizations, educational institutions, faith-based organizations, tribal, state and local government agencies. Family Promise Rochester to update training materials for their volunteer program and to support the Life Skills program which teaches financial literacy and job searching skills to families experiencing homelessness. Faribault Diversity Coalition to organize a toolkit for a coaching program that connects volunteers with minority entrepreneurs and to develop policies and procedures to support the newly renovated Community Coworking Center which helps minority startup businesses reduce the barrier to entry by leveraging low-cost shared resources including office space. Lake City Economic Development Authority to leverage connections made through SMIF’s Rural Entrepreneurial Ventures (REV) program by supporting low income residents and the Hispanic community through bilingual trainings, business resources and presentations. Additionally, CNCS has awarded Southern Minnesota Initiative Foundation to host a VISTA member to expand tools for the Prosperity Initiative program which promotes inclusive entrepreneurship and minority-owned businesses growth in southern Minnesota. The member will research opportunities for the program’s longevity, develop evaluations for clients, develop an alumni program, and survey graduates of the program. Organizations will be recruiting members this spring. For more information contact Barbara Gunderson, AmeriCorps Director at SMIF, at barbarag@smifoundation.org or 507-456-0353. VISTA is a national service donor sponsorship of Southern Minnesota Initiative Foundation and the Corporation for National and Community Service. We are committed to recruiting and engaging individuals without regard to disability, gender, race, religion or sexual orientation. Reasonable accommodations provided upon request.